I love springtime. At the moment with winter turning into spring it's lovely to see things growing as the days are getting longer. Seasons, nature, travel and the environment inspire me to create. 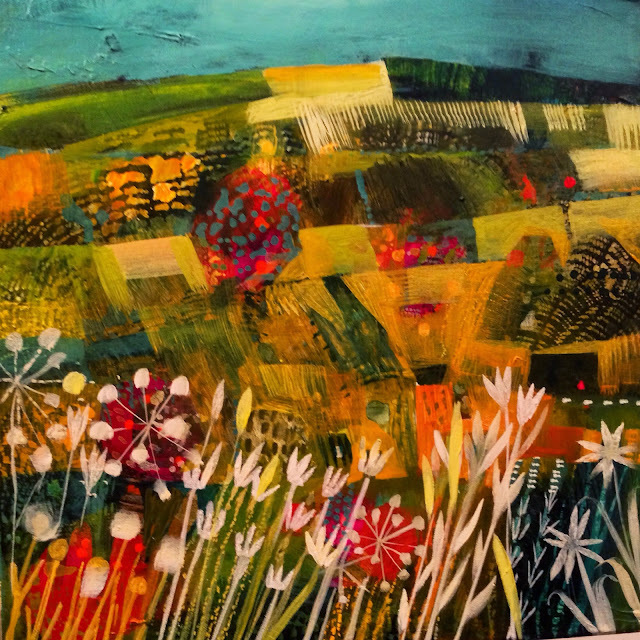 I also love colour, it is probably the most important and continuous inspiration for my paintings. Here is a documentation of a 40x40cm acrylic on textured canvas. I started on a black gesso background. 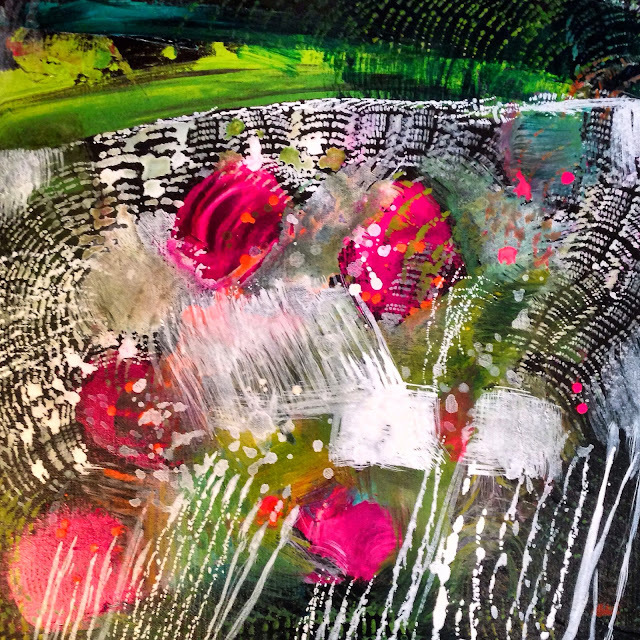 Applying thin layers of colours to create a texture and rythm to build upon. A meadow with a small bit of sky started to appear. GOLDEN high flow and fluid paint is used for thin but opaque layers and marks. White details are over painted with transparent washes of acrylic matte medium and GOLDEN* fluid paint. 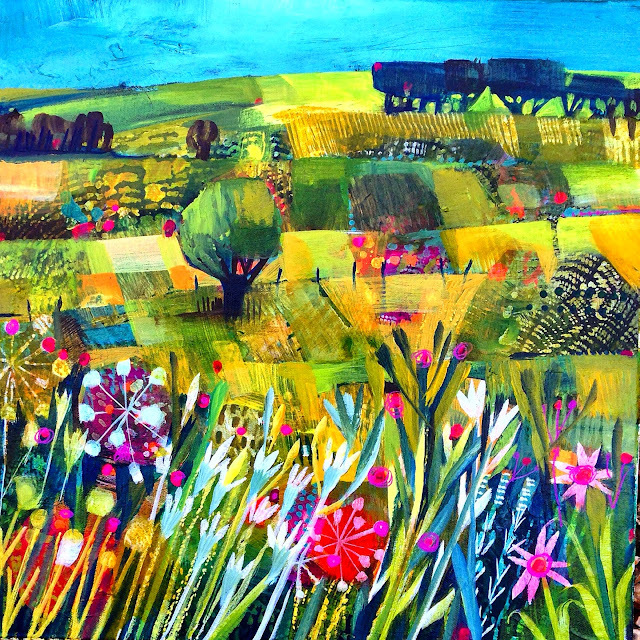 More detail is added on an blocks of colour defining the fields, sky and trees. Fresh bright greens and little pink flashes to catch the eye and lift the heart. An A3 print will be given away to someone on the mailing list. To join the list either go to http://www.estemacleod.com or sign up on the top right hand side of the page. Winner of the print will be emailed. I'm currently working on the content of an online painting course. 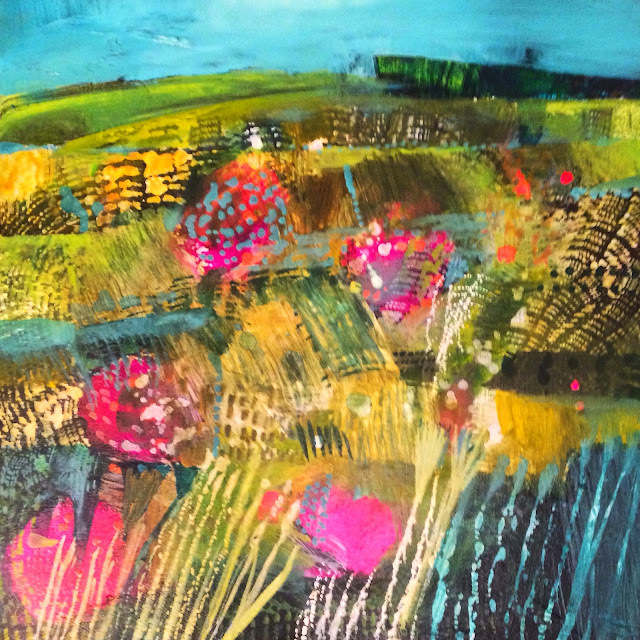 In September a two weekend long workshop exploring colour will be offered. Students will get to experiment with new acrylic painting techniques as developed by myself in my practise. Using paints such as FLUID, HIGH FLOW, HEAVY BODY and OPEN along with painting medium, it's bound to be engaging, fun and informative. Spaces are limited to sixty students.